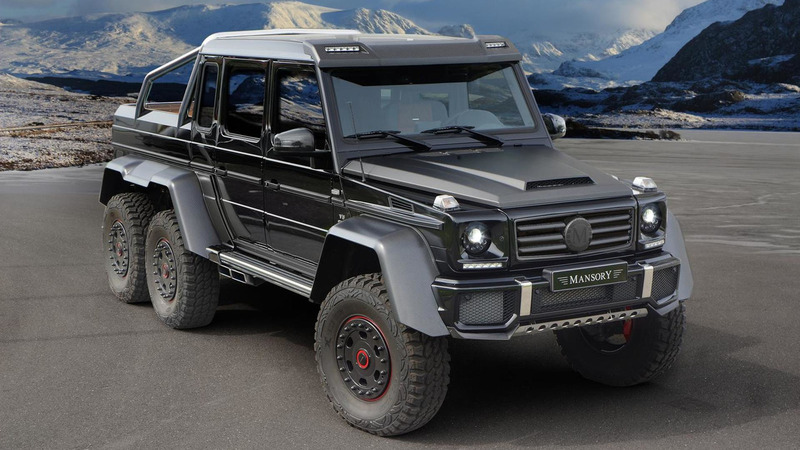 Mansory has released a full customization program for the exclusive Mercedes-Benz G63 AMG 6x6. Addressing a very limited crowd, Mansory has created one of its look-at-me styling kits for the opulent six-wheeled G-Class featuring redesigned headlights matched with an updated hood and grille. There are also several carbon and fiber bits and pieces such as the mirror housings and side skirts. The biggest change is under the hood where the tuner "has completely reworked" the V8 5.5-liter twin-turbo engine which has received "genuine racing components." Mansory installed different connecting rods, pistons, bearings, cylinder head as well as a new crankshaft and exhaust system. Thanks to these upgrades, output of the eight-cylinder motor was increased from the series 544 PS (400 kW) and 758 Nm (560 lb-ft) to no less than 840 PS (618 kW) and an electronically-capped 1,000 Nm (737 lb-ft). Although photos of the interior were not provided, the tuner is offering many carbon fiber elements together with several types of leather, Alcantara and wood trims.